Promoted Dunfermline Athletic face a trip to Annan in the newly branded Scottish Communites League Cup. The Pars are the only Scottish Premier League team involved in the opening round, on 30 July, the second Saturday of the top-flight season. Queen of the South host south of Scotland rivals Stranraer in the only derby to emerge from the draw. Livingston host Arbroath in a match-up of the Second Division and Third Division champions. Five First Division sides have been handed potentially tricky away ties. Dundee travel to face Dumbarton, Montrose host Raith Rovers, Morton are away to Alloa Athletic, Falkirk are at Albion Rovers' Cliftonhill Stadium, while promoted Ayr United meet East Stirlingshire. The Scottish Football League-run competition is being sponsored by the Scottish Government after Co-operative Insurance ended its 12-year involvement. A £1m funding package will come from the Proceeds of Crime Act, using cash seized from criminals. 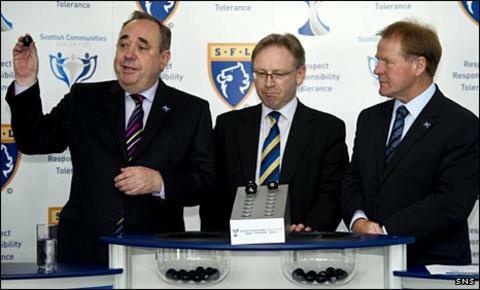 First Minister Alex Salmond made the draw along with former Borussia Dortmund, Celtic, Dumbarton, Hibernian and Scotland midfielder Murdo McLeod. And Salmond said: "The SFL and its clubs already carry out invaluable work across the country and we want to build on these partnerships to encourage positive change in attitudes in our local communities." The new scheme will attempt to increase involvement in sport for young people through the clubs, who have been promised greater support to work with their local community to address alcohol misuse, sectarianism, racism, domestic abuse and violence. SFL chief executive David Longmuir added: "This partnership is one that I believe will result in positive results for the Scottish Government and the Scottish Football League, but the wider benefits will be felt by everyone in local communities. "Football fans of all ages, young people generally, parents, schools, teachers and our clubs at the heart of their local communities all stand to gain from the focussed efforts of the partnerships the Scottish Communities League Cup will generate." Rangers are the cup holders having beaten Celtic 2-1 after extra time in the final at Hampden in May. Ties will be played on Saturday 30 July.